Someone claiming to be a designer at Ford has been answering questions about the next generation Ford Bronco and Ranger in a Reddit AMA. In it, the alleged designer claims the 2020 Bronco and 2019 Ranger will be basically refreshed versions of the Ford Everest and Ranger, an SUV and truck sold in other markets. The Ranger news is not a surprise, but if the Bronco is an Everest, it won’t look as rugged as we all seem to want it to. All questions in the AMA were answered by a user named FordDesignBurner, whose identity was verified by Reddit Mods. It’s worth mentioning that Ford told us over the phone that this AMA was not sanctioned by the company, and that they don’t have any info on the person answering the questions or his or her identity. It will essentially be a rebadged Everest but there will be differences. It will be a 4 door. I definitely can’t discuss pricing in detail but it will be competitive with the Colorado and cheaper than a similar F-150. This makes sense, as we suspected the Bronco would be Everest based, and four-door only makes tons of sense when you consider how few people actually buy two-door SUVs (less than 25 percent of Wrangler sales are two-doors). And while the Everest may not look it, it is body-on-frame, not a crossover; that would jibe with what we learned yesterday from Ford about the Bronco being a real body-on-frame SUV. Pictured: The current Ford Everest, sold in other markets. Not exactly a Wrangler-killer. We are benchmarking the Wrangler Unlimited for design considerations on the Bronco, but the doors/roof/windshield won’t move. 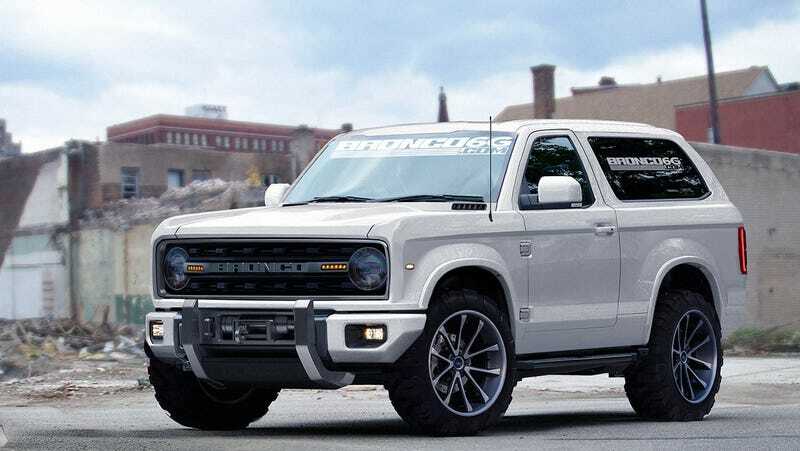 As for styling, when asked if the new Bronco would take cues from Broncos of yore, the Redditor said “Not really, both vehicles will be based on current production models,” referring to the SUV and the new Ranger. God, I hope this guy is wrong. The removable top was one of the most appealing aspects of the Bronco, and surely one of the traits that draws people to the Wrangler. Plus, four-door only, and it won’t take any styling cues from classic Broncos? Sounds like this thing won’t really be a Bronco, it will just have a Bronco name. Which is kind of disappointing. Both vehicles will likely have similar off road capabilities in their off-road oriented trim level. It will be facelifted, new headlights, grille, and front fascia. Corporate has mandated that the major body panels go unchanged. Our test mules are visually comparable in size to my coworker’s ‘02 F-150, but I haven’t taken a tape measure to either truck. So, the Bronco won’t look like a Bronco and it won’t have a removable top, and the Ranger is going to be bloated. Doesn’t sound very exciting to me. I’ve provided that proof (pic of my ID) of my working at Ford to the moderators of this sub. Earlier this morning, someone else commented on the thread saying “I call BS” and I’m naturally nervous over this. I also have to tell you that this AMA is not in any way sanctioned by management, I am doing this because I am a Ranger owner. That is why there are certain details (drivetrain combinations, price points) that I won’t give more than a vague answer on - I know what direction it’s heading, but those are details that, if leaked, would start a witch hunt. So, all of this may or may not be true; if it’s not, that was a whole lot of work, and a lot of really reasonable and insightful-sounding answers for would essentially be just an elaborate hoax. I for one, hope this guy is wrong, simply because I want the new Bronco and Ranger to be very similar to their ancestors. Partly because those old Fords were awesome, and also because I just love old cars and can’t handle change.